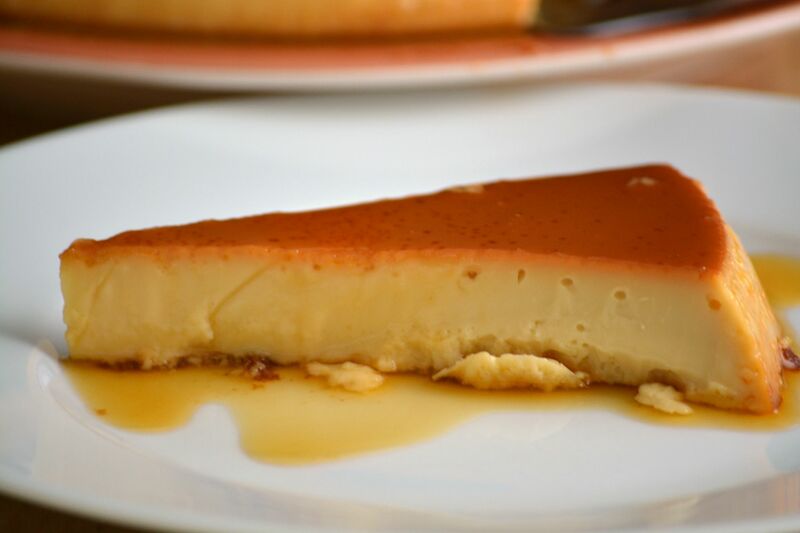 After seeing the great welcome that the recipe I posted last year to make leche asada (milk custard) received, I decided to post the recipe that I always use to make homemade flan. The differences between both recipes are very few, so much so, that many people get both of them confused. Leche asada, for example, is baked directly in the oven without adding any hot water and it’s made with three different types of milk, which is the reason why some people call it the “three milks dessert”. Flan, on the other hand, is baked in a water bath and it’s usually made without heavy cream. Many people make it with only whole milk and white granulated sugar, but I personally like the version that is made with sweetened condensed milk. The most difficult part of this recipe is making the caramel, and to be honest, I think it’s really easy to make. 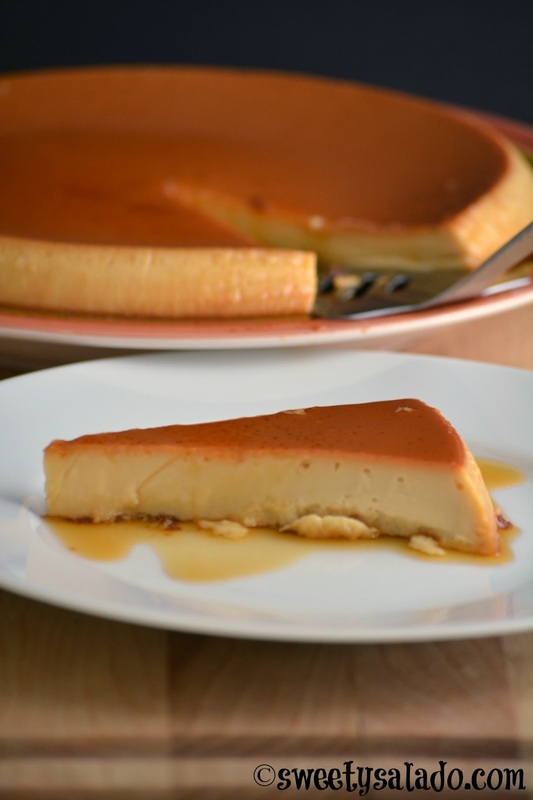 So, anyone can make a fantastic flan without having any experience in the kitchen. And remember that the amount of eggs is to change the flan’s texture. The more eggs and egg yolks you use, the smoother and thicker consistency it will have. If you want a looser consistency, then you can reduce the amount of eggs that we’re using in this recipe. Place the white sugar and water in a medium pot and let it melt on medium heat until it turns a caramel color. This can take between 10-15 minutes. Pour the caramel into a 9 inch (23 cm) pan and swirl it to make sure you cover the sides of the pan. Set it aside. Blend the eggs, egg yolks, evaporated milk, condensed milk and vanilla extract in a blender until smooth. Place the baking dish with the caramel inside a larger baking pan or roasting pan. Pour the custard into the baking dish with the caramel. Then, pour in the hot water into the larger pan until it comes halfway up the sides of the smaller baking dish. Bake for 50-60 minutes or until it sets in the center or until a toothpick inserted in the middle comes out clean. Take it out of the oven and let is cool completely at room temperature. Then, cover it with plastic wrap and refrigerate it for at least 4 hours. Scrape the sides of the baking dish with a knife to loosen it. 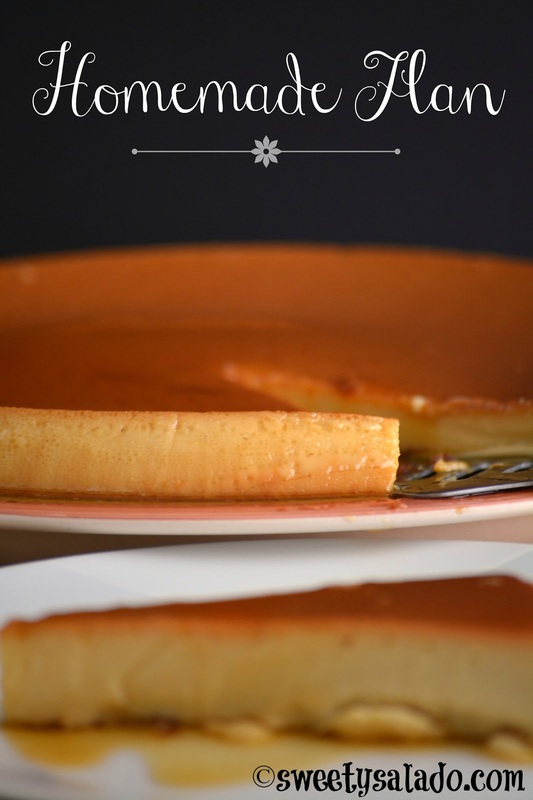 Place a larger serving dish on top of the flan and carefully invert it. Divide it into portions and serve.